Read an interesting article by Joel on software scheduling. Most organizations either use the use-case point estimation method or the function point estimation method. But the best estimates come from experienced designers and developers - because you have done something similar in the past, you are more confident of the estimates you give. But how can you bring in these past experiences of people into your estimation process. We would need to collect data on all past and present projects and extract metrics from them. In the article, Joel talks about "evidence-based scheduling (EBS)" - i.e. base your future estimates on past experiences and developer productivity. It might be difficult to record the productivity of each and every developer, but we can create clusters for a developer group based on yrs of experience. The most interesting point regarding EBS was that you do not have a single delivery date - you only have probabilities assigned to a range of dates. I always struggled selling this concept to program managers and customers. 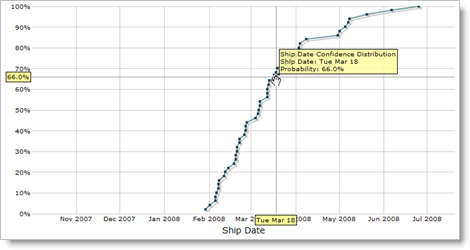 The point is that its impossible to predict the exact date of shipment at the start of the project. Based on fine granular tasks and past estimation data, we can use algorithms such as "Monte Carlo Simulation" to arrive at a range of dates each with a probability index assigned to it - similar to the image below.